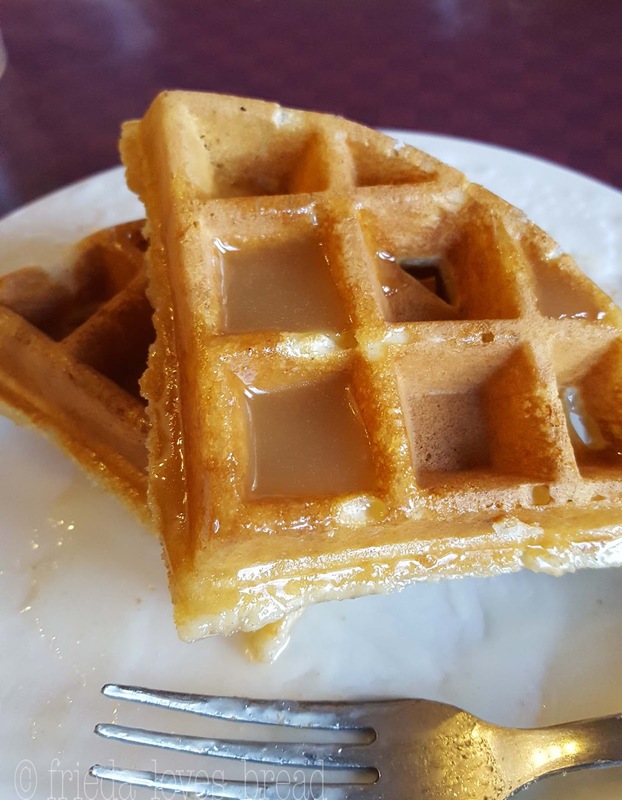 A thick, crisp, light and fluffy Belgian waffle, drenched in syrup, gets a makeover with spices and buttermilk syrup. Buttermilk Waffles are a weekend favorite, as you can fill each square with the perfect amount of syrup, just right for each bite. 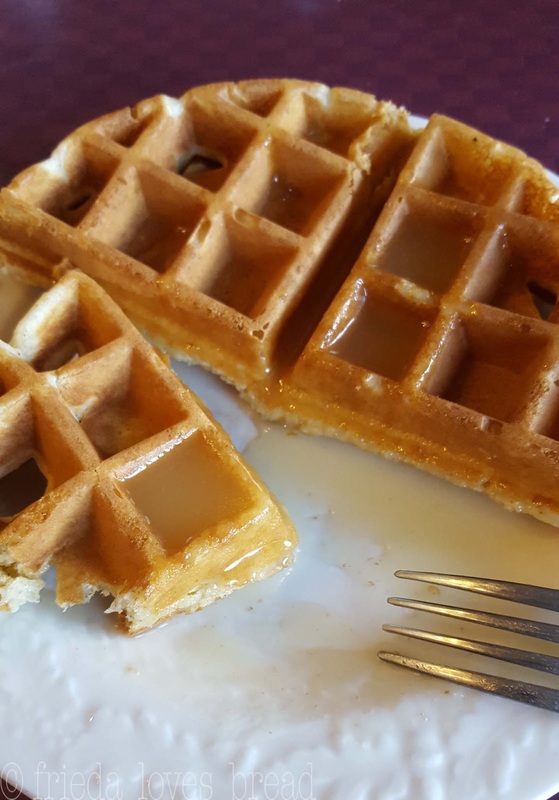 With the holidays around the corner, I looked for a spiced waffle and this Gingerbread Waffle recipe from King Arthur Flour fits the bill. The buttermilk syrup is just right, adding a sweet touch and compliments the spices. Granted, I don't have all the ingredients to make these festive waffles, but there are some substitutions you can use. For instance, the recipe calls for sour cream and molasses. 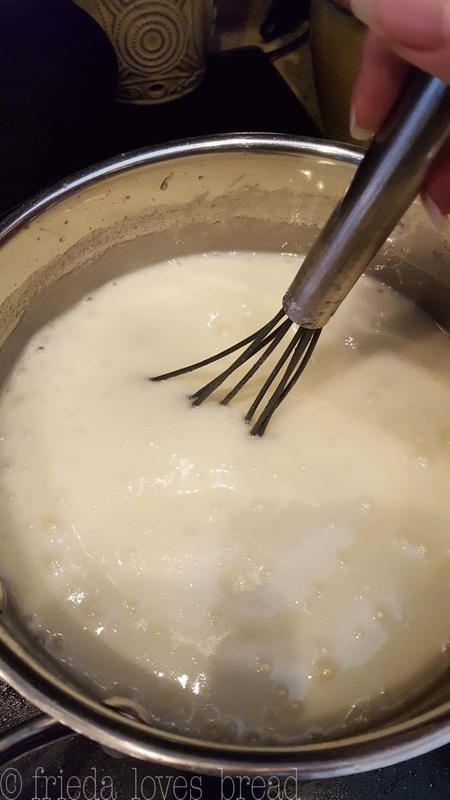 I used homemade yogurt, which works just as well as sour cream, adding a slight tang and providing moisture to the batter. You can also use soured milk (lemon juice + milk) or buttermilk as a substitute. If you make your own yogurt, you can use whey as an acid to sour the milk. Molasses is something that I have on hand for making soft gingerbread men cookies, but I don't use it year round for anything else. To me, it has a very strong taste. You can use brown sugar (dark or light), dark corn syrup, or even maple syrup as a substitute for molasses. I opted to use brown sugar. Buttermilk syrup is soooooo good. 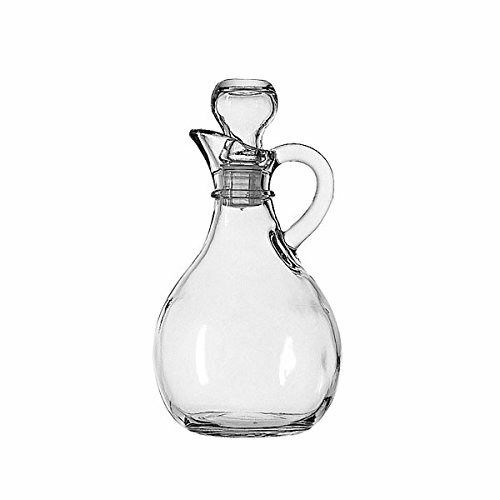 It is sweet, slightly tangy, and made with pure vanilla extract, I think it would be great to bottle and give as gifts. 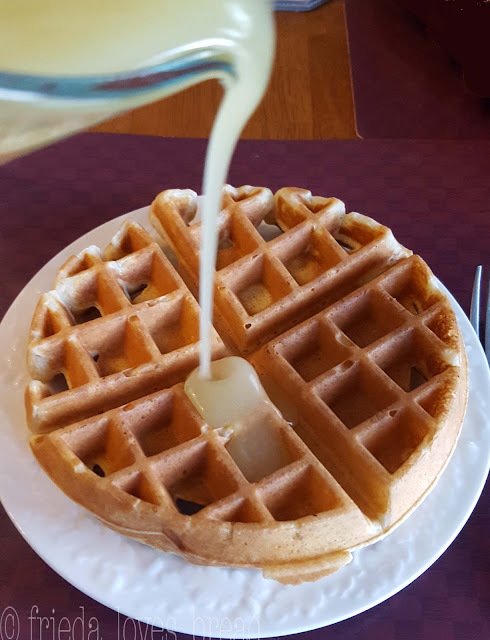 It's fantastic as a pancake/waffle syrup, sauce, or ice cream topping. I have Saco buttermilk powder on hand for making bread, biscuits, pancakes and waffles, but it was easier to make soured milk. Heat the sugar, buttermilk (soured milk) and butter in a heavy bottom 3 quart sauce pan. Using this size of pan is important, as the syrup will double in size while heating. A thick, heavy bottom pan will help keep the mixture from burning. You will want to stir it constantly, to keep the bubbling under control. A flat whisk is a great tool for this. After it reaches a boil, cook it only for 5 minutes, then remove it from the stove. Wait till the bubbling subsides and add the baking soda and pure vanilla extract. The baking soda gives the syrup a foamy, airy texture and the extract will give it a lovely vanilla flavor. TIPS: Use a large pot. 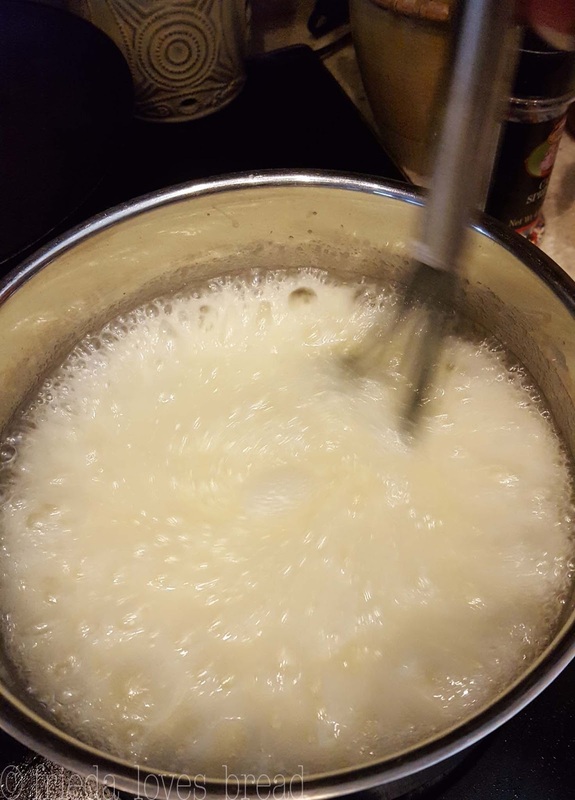 The syrup will foam, bubble and double in size. Stirring constantly helps keep the bubbling under control. Do not cook it for very long. If you cook it longer, it will become darker and more like a caramel candy. It will also set firmer and not be as syrup-y if cooked longer. It will become more chewy. Do not walk away. Stir it and stir it constantly. If you walk away, it will double in size and possibly overflow, creating a big, sticky mess. In a mixing bowl, whisk together flour, baking powder, baking soda, salt, and spices. In another separate bowl, mix together eggs, melted butter, milk, yogurt and brown sugar. Pour the milk/egg mixture into the flour/spice mixture, stirring until just combined. A few lumps is o.k. Ladle about 3/4 cup batter into your waffle maker and cook according to your waffle maker directions. Makes about 5-6 Belgian style waffles. Can make ahead and store in freezer bags. 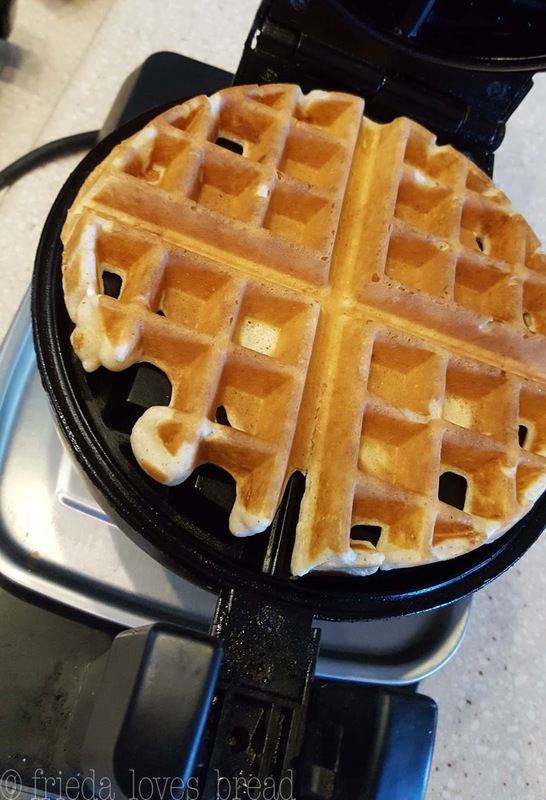 Reheat by putting your waffles in the toaster. 3/4 cup butter milk -or- 1 tablespoon lemon juice and enough milk to make 3/4 cup. Let sit 5 minutes. In a heavy 3 qt saucepan, melt the butter. Add sugar and buttermilk (or soured milk). Over medium heat, allow mixture to come to a rolling boil, stirring constantly for 5 minutes. Remove saucepan from heat. Wait for bubbles to subside. Add baking soda - stir vigorously, as it will foam. Serve warm over pancakes, waffles, cake or ice cream. Refrigerate up to 2 weeks. Reheat to serve.